With the school season starting up again, I've been on the hunt for a new travel mug to take my morning tea on the go with me. As I was browsing online, I came across Adagio.com, a fabulous tea site I hadn't known about before. As someone who drinks tea pretty much non-stop every day, I'm extremely particular about the type of tea and tea accessories I use. Adagio has taken my travel mug requirements to a whole other level with their ToasTEA travel infuser! I've never seen anything like it before. It lets you brew your tea and take it on the go all in one sleek tumbler. I even use it to brew my tea at home. Adagio also has a massive selection of loose leaf teas to choose from to go along with the infuser. Together, this would make the perfect upscale gift for tea lovers! This 17oz travel infuser is made of double-walled stainless steel construction that keeps your tea seriously hot (or cool) for hours. I love that I can brew it in the same container that I walk out the door with. I also like that the spring-loaded lid allows you to open it and drink it with one hand. Great for my long trips in the car each day. The seal is vacuum-tight, so it can keep the liquid hot for several hours. (And I mean HOT! Be careful when you sip it to be sure it's cooled down enough.) I actually untwist the lid when I'm done brewing it to let some of the heat out. I find that it's the perfect temperature for me to drink in the car this way. The tumbler comes in 3 different colors: blush, charcoal, and lemongrass. I chose blush and it looks even more vibrant than it does online. Fill the tumbler with hot water. Unscrew the infuser from the cap and put 1 teaspoon of your favorite tea inside. Screw the infuser back onto the cap. Put the lid on the tumbler and seal it tightly. Flip the tumbler upside down for as long as you'd like to brew the tea. When you're ready, turn it right-side up and you're good to go! **A word of caution: The steam pressure builds up in this travel infuser (Adagio actually warns of this in their packaging), so you should NOT open the lid near your face. A few times I've pushed the button and the lid opened with some serious force and tea leaves. I'm extra cautious about this now. Clean up is super easy, as you can simply shake or rinse out the tea leaves when you're done and wash the tumbler as you normally would. Watermelon Cooler Herbal Tea - Another great summer tea, but honestly, I think this is great for holidays all year around as well. It's sweet, juicy and refreshing with notes of cranberries and hibiscus. Great as iced tea on a hot day. Adagio recommends adding a pinch of mint or a twist of lime to create a tasty watermelon mocktail. Head over to the Adagio.com to peruse the site and find the perfect teas for you or the tea lovers in your life! 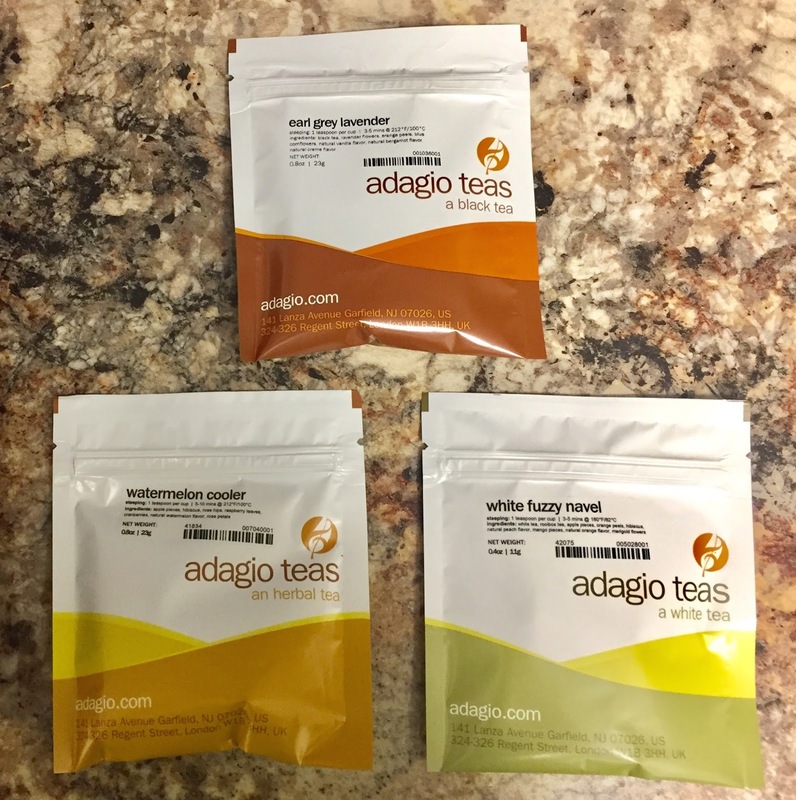 Disclaimer: The products in this post were provided by Adagio.com. As always, our posts are our own, honest opinions.